Dalbello's first Women's Lupo, the new AX 110 W is a crossover freeride/touring model that combines incredible touring performance combined with on-mountain versatiity, with a huge size range that extends all the way down to a 21.0 Mondo Point! Tech inserts and a removable external tongue help you go up, and the legendary freeride performance of the cabrio design allows you to rip it up for the way down. 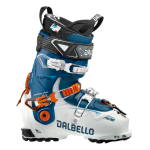 Unlike overlap boots adapted for touring, where the lower shell is modified (weakened) to allow the boot to go into walk mode, with Dalbello’s cabrio design the lower shell has the same design in both touring and non touring applications. The new IF AIR liner is thermo-formable for an optional instant break-in in just a few minutes.